The articles collected here (two appearing for the first time in English) cover a number of topics central to naval history and illustrate the author's contention that this is not only, or even chiefly, a distinct area of special study, but rather a central theme running through the history of England, and of the whole British Isles. Though the subjects and the styles vary a good deal, the studies are linked by a common approach and some common ideas. Hence many examine ways in which naval history has formed a key element in such subjects as intellectual, religious, administrative or medical history and explored the nature and meaning of sea power as a theme. At the same time naval history is a technical subject, which demands a willingness to understand warships - the most complex artefacts - and the structure of large and complex organisations. 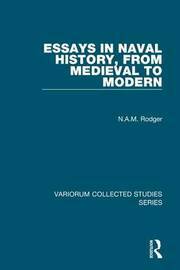 Detailed evidence about ships and weapons can build large conclusions, for example about late Anglo-Saxon government and military organisation, or about the nature of warfare at sea in the Renaissance era. While mostly written from the British point of view, several essays explicitly survey naval developments over a range of countries, and even the most narrowly focused are at least implicitly aware of the wider world of war at sea.